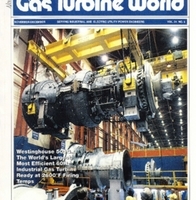 The item is a copy of a reprinted article from the Gas Turbine World magazine issue for November-December of 1994. The subject of the article is the Westinghouse-Mitsubishi 501G gas turbine that had been introduced at the American Society of Mechanical Engineers (ASME) International Gas Turbine Conference earlier that year. The 501G was a new gas turbine engine design featuring the results of a joint design effort of Westinghouse Power Generation and Mitsubishi Heavy Industries (MHI) of Japan. Other input to the design was provided by other members of a multi-national alliance, which included FiatAvio of Italy and Rolls-Royce of the United Kingdom. The 501G was touted as the "largest and most efficient" gas turbine in the world. Introductory simple-cycle power rating was 230MW and simple-cycle efficiency was 38.5 percent (8,860 Btu/kWh, gas, LHV, ISO conditions). The combined cycle performance being quoted at the time was 345MW with a heat rate of 5,883 Btu/kWh (58% efficiency). The 501G was last of the long line of Westinghouse gas turbines before the company was acquired by Siemens AG of Germany in 1998. The first 501G was built at Westinghouse's factory in Hamilton, Ontario, Canada, and installed at the McIntosh Station in Lakeland, Florida, in 1998. Original 8-page magazine article: Farmer, Robert. "Steam-Cooled 501G Rated 230 MW with 2600°F Rotor Inlet Temperature." Gas Turbine World, Vol. 24, No. 6, November-December 1994: Private Collection of Harry Jaeger. Digital reproduction of original 8-page magazine article: Farmer, Robert. "Steam-Cooled 501G Rated 230 MW with 2600°F Rotor Inlet Temperature." Gas Turbine World, Vol. 24, No. 6, November-December 1994. Originally created by Robert Farmer and published by Gas Turbine World. Copyright to this resource is held by Gas Turbine World and is provided here by RICHES of Central Florida for educational purposes only. Farmer, Robert. “Steam-Cooled 501G Rated 230 MW with 2600°F Rotor Inlet Temperature.” RICHES of Central Florida accessed April 22, 2019, https://richesmi.cah.ucf.edu/omeka/items/show/6597.